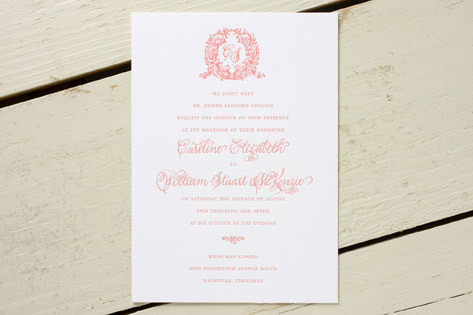 A classically elegant, wreathed monogram sits atop this lovely letterpress wedding invitation, giving friends and family a glimpse at the representation of the couple's joining in matrimony. The suite also features an ornate envelope liner, plus decorative paper, ribbons, folders, and colored envelopes as possible options. Available in coral (shown), gold/petal, petal/kelly, cornflower, merlot, and gold.